This time of year a lot of people are staring at more zucchini and tomato than they know what to do with. (Ok, I wish we had more tomatoes than we knew what to do with, we've had one this year!) 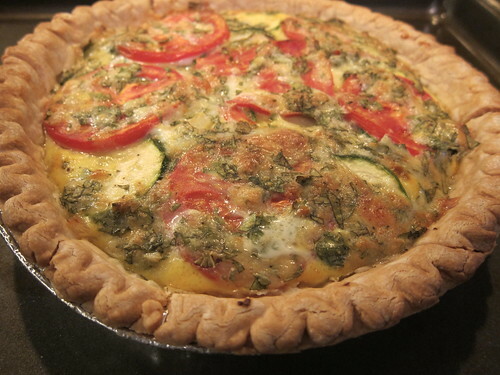 This pie is a nice use of this late summer bounty including fresh basil and oregano from the herb garden. I kept the egg binder to a minimum in this dish, so it would be lighter and keep the vegetables and herbs as the stars of the show. I used a frozen, pre-made pie crust for this since I had one in the freezer, but if you are feeling ambitious go ahead an make your own. Heat the olive oil in a skillet over medium-high heat. Add the onion and garlic and sauté until the onion is translucent. Add the zucchini and sauté another 5 minutes until softened a bit. 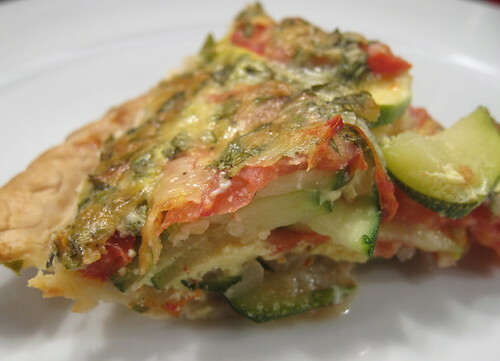 Layer half the zucchini and onion mixture into the pie crust. Layer the slices from one tomato on top. Repeat with the remaining zucchini mixture and then the last tomato. Whisk the half and half and eggs together. Stir in the basil, oregano and cheese. Season with a pinch of salt and few grates of fresh pepper. Pour over the top of the vegetables in the pie crust trying to spread out evenly. Bake for 30 minutes until the crust is browned and the filling is cooked and firm. Great simple recipe. I like that the premade pie shell actually looks homemade. This looks so delcious! I have been all about tomato pie for some reason this year. Can't get enough. I know what you mean about tomatoes. Ours didn't go crazy this year (although we did have more than one :)), but other people seem to have a ton.